True Blue Southern Nyonya Dishes… Soul Food! Authentic Peranakan cuisine is rare today… yes, plenty seems to try and hold the title for this cuisine but many honestly have lost the authenticity of cooking Peranakan dishes the traditional way. Honestly, it’s really a hard cuisine to replicate because of all the efforts and time consuming cooking methods, not least to mention all the ingredients it takes to make up the dishes. During those days, Nyonya cooks would spend the whole day in the kitchen preparing the dishes from lots of physical pounding to tedious chopping and slicing. These days, time seems to be our enemy and everyone is busy working rather than devoting their whole day in the kitchen. With all these said, there are still a few dedicated ones out there going all out to preserve the authentic flavors of Peranakan cooking as much as they can. Uncle John, as we all dear lovingly call him, is one of them. He enjoys cooking Peranakan dishes and he takes great pleasure in seeing others enjoying his dishes. Holding fort at Lima Blas, Uncle John has been humbly dishing out Peranakan dishes from his own and his wife, Chef Florence Tan’s recipes. 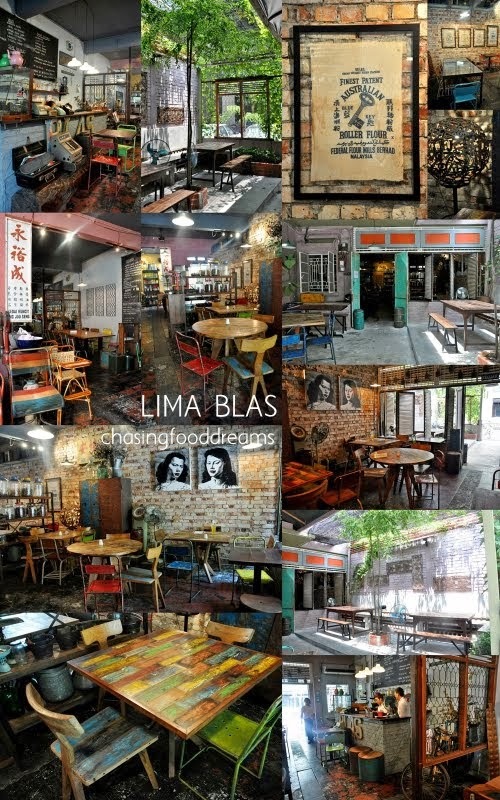 Lima Blas, located in the heart of the city at Jalan Mesui, is cheekily coined after its numeric address. Guests may want to look out for Lima Blas as there is no big signage except for the numeric signage on the front of the restaurant which is next to another restaurant called No Black Tie. Lima Blas has a lovely shady patio at the entrance where guests can opt to enjoy alfresco dining. Long tables with various chairs are fronted by bright blue doors and other colors on the walls. Head on inside and one is greeted with a contemporary vintage interior where many of its furniture and décor are recycled to give it a new look. Besides looking contemporary, Lima Blas has a welcome feel… it almost feels like I have taken back a step into time and yet, it has a modern touch. From various old shop signages to worn and framed flour mill bags, furniture tainted with colors, modern contemporary art pieces and other vintage decors, Lima Blas is a photographer’s dream. Menu is displayed on large chalkboards and there is a long cement bar with wood top. Brick walls, old worn floor tiles, steel panels and dark ceiling complete the ensemble. The menu is fairly tight and offers a nice selection of dishes to go with rice. There are also lunch sets for single dishes and price is really fair, especially during lunch. We came over to meet up with friends and we had some dishes to share. Homemade and unexpectedly delicious, especially on a sunny hot day, the Peranakan Ginger Ale was a thirst quencher of ginger ale. Lovely and so delicious! Always a favorite of mine, Lima Blas’s version has the essential crispy thin shells and sweet juicy jicama filling topped with prawn. Add a dollop of chili sauce to perk this up and flavors will explode in your mouth. My mom makes this version really sour and spicy. Uncle John’s version is equally tantalizing with a nice hit of tangy and piquant asam flavors. A spoonful of gravy evokes aromatic lemongrass, chili, ginger torch and lots of other herbs and spices. Pieces of stingray are cooked perfectly with sliced lady’s finger. I loved that there are plenty of gravy because I certainly soaked my rice with lots of it. Ah… lovely moments of my mom’s Gerang Asam from Uncle John’s kitchen! A dish that simply begs for rice, it is a Nyonya recipe of chicken with tamarind and coriander. Braised till thick, the brown gravy chicken is jazzed up with colors of onions, cucumber and chili. The flavors are quite distinctive… a nutty and light citrusy aroma with savory notes and a light tang from the tamarind. Uncle John makes his thick and rich with beautiful flavor, hitting all the right spot for this dish. Uncle John is particularly proud of this dish and I can understand why… it’s a scrumptious sambal! Soft long pieces of eggplant are soaked in an unctuous spicy sambal sauce and serve in its full glory. There may not be much sauce but every piece of the melt-in-the-mouth eggplant is definitely well flavored. We finished off with desserts as usual. A Nyonya must-have is Sago Gula Melaka, a dessert that is really simple but relies heavily on quality ingredients of rich syrupy thick Gula Melaka, fresh coconut cream and boiled Sago. Highly popular at Lima Blas, we were happy to be the last one to get a bowl of this dessert that day. A wobbly delight, this is luscious and sweet, hitting all the right notes for a classic. A Malaysian national dessert, this bowl has all the usual ABC condiments. I like that Uncle John uses thick and aromatic Gula Melaka in his desserts making it really fragrant and sweet. A popular dessert as well, I am now convinced that it is the Gula Melaka that is making all the desserts really good at Lima Blas. The cendol is soft and smooth while creamy red beans and coconut cream together with the Gula Melaka turns this dessert into a favorite one! We went back a second time on a weekday just for this! 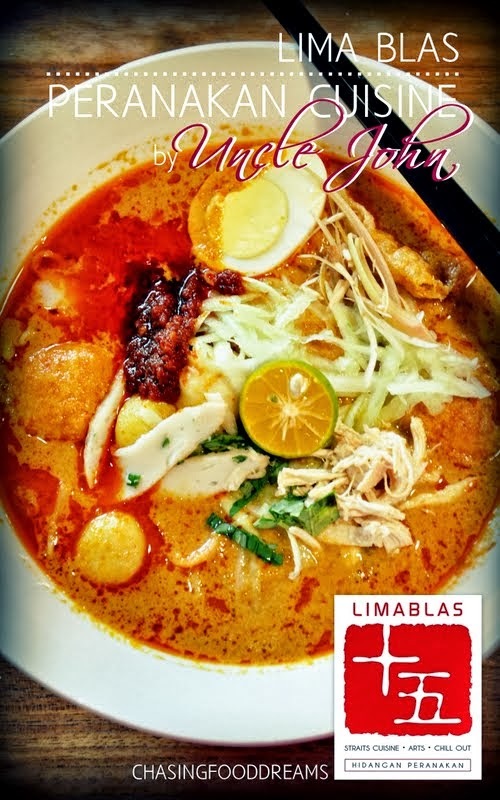 After many ravings from the blog sphere, we had to be convince on Uncle John’s Nyonya Laksa. We even told Uncle John we were coming to ensure we got our bowls of laksa. Uncle John only makes a 17-bowl portion each time on Monday, Wednesday and Friday for lunch. It’s first come first serve basis. If laksa is not your thing, check out set lunch Ayam Pongteh with comes with rice, egg omelette, sautéed cabbage and sambal belachan. Yummy enough, the fermented bean sauce braised chicken has mushrooms and potatoes too. It has a nutty and creamy salty flavor that seems to taste even better after every spoonful. Normally I wouldn’t order fried beehoon as I always have this perception that it’s boring. When this one came, we tried it and were immediately sold. Copious amount of wok heat and fluffy soft strands of rice noodles are well seasoned. Bits of sweet onions and crunchy cabbage give this a nice texture. The ambience makes it perfect for photos and provides much conversation piece. 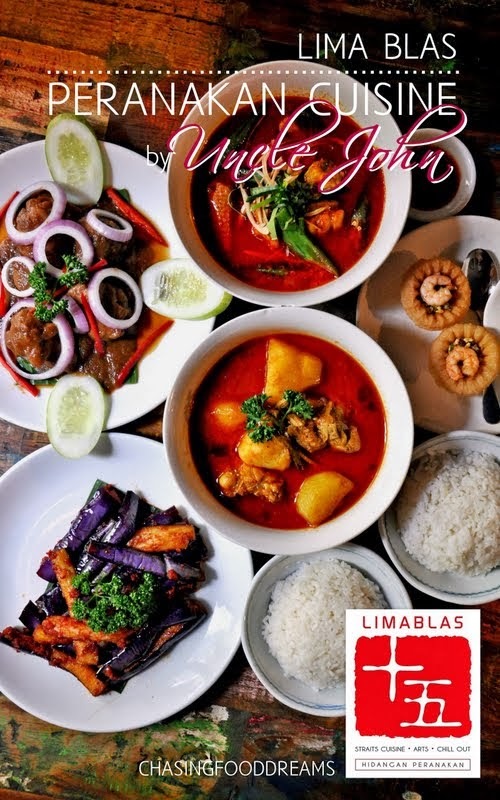 Though perfectly charming, it’s the Uncle John’s dishes that makes Lima Blas drool-worthy for many returns. The dishes are authentic and flavorful. Uncle John literally watches like a hawk to ensure all his dishes are as true to his recipes as can be. Make sure to get a bowl of his Nyonya Laksa if you can… damn shiok! Ahhhh!!!! Gotta go and try! I love Peranakan. Went to Mako's in Malacca - overrated, nothing like what it was many many years ago when it was small and dark and not as famous. Is this restaurant still operating, since Mr Old Uncle is currently running Limapulo?